Title: 10/06/1995 - Clarification of the OSHA reference to welding rods in a March 21, Memorandum to Regional Administrators. This is in response to your letter requesting clarification of the Occupational Safety and Health Administration's (OSHA) reference to welding rods in a March 21, Memorandum to Regional Administrators from OSHA's Directorate of Compliance Programs (DCP). The Memorandum was issued to provide guidance on the type of documentation that should accompany Hazard Communication Standard (HCS) citations for exposures to materials that could be covered under the consumer product or article exemptions of the HCS. Your specific question was whether OSHA considered welding rods to be either consumer products or articles. Welding rods are solid, manufactured items that are formed to a specific shape. When maintained in this manufactured shape, welding rods do not release more than minute or trace quantities of hazardous chemicals, and therefore, could appear to be articles exempt from the HCS. Under normal conditions of use, however, welding rods emit significant quantities of metal fumes and other hazardous chemicals and do not meet the HCS article exemption. Where available, attach the MSDS for the cited product. We hope this response provides the clarification you need. If you have further questions, please contact OSHA's Office of Health Compliance Assistance at (202)219-8036. 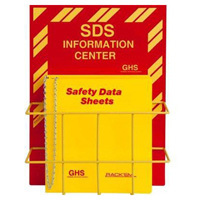 Safety Emporium has all kinds of labels for assisting with your OSHA compliance needs. Subject: Hazard Communication Standard: Documentation of Citations Related to the Exposure to Hazardous Substances and Consumer Products. The March 21, 1995 memo of the above subject discusses documentation related to exposure to both consumer products and articles. The State of Hawaii agrees that dishwashing liquids and some lubricating oils are consumer products. We also agree that bricks and rebar, in most cases, are articles; but we do not understand the context of including "welding rods" within the second paragraph. Does OSHA consider welding rods to be consumer products or articles? If so, please include the rationale for its inclusion. Regardless of the category, Hawaii does identify the specific hazardous chemical that is emitted by the particular welding rod under normal conditions of use. However, we do not feel a need to compare it to "normal or expected use by a consumer." We appreciate and welcome the clarification and attempt of standardization of citation documentation. Thank you for the continuing fine work you and your staff have done.